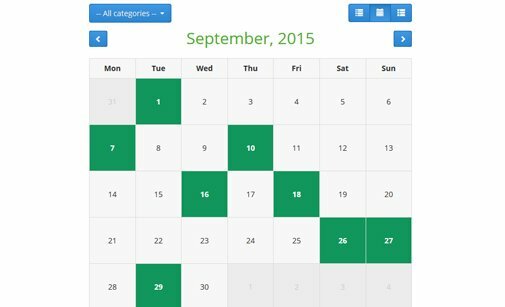 Availability Calendar is a simple PHP-based multi-user calendar script that can be deployed on any website. It's perfectly suited for holiday property rentals, sport facilities' arrangements and other scheduled services when you need to show daily availability on your website. Through the admin panel of the PHP Availability Calendar script you can easily create calendars, manage their availability and appearance, manage user access. Almost every activity/service a company or organization may offer to its target audience needs a proper online presentation. 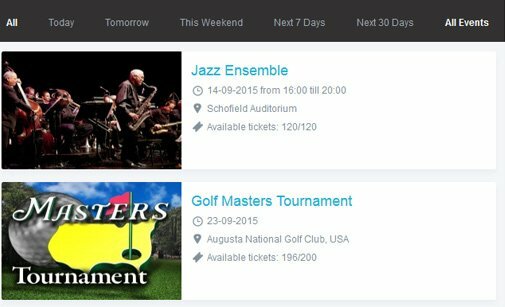 Provide your customers and website visitors with a web-based calendar tool which shows availability of all your events and enable a 1/3/6/12-months view. Customize the calendar appearance by editing color options, calendar size and font style through the calendar back-end. There are three types of users who can access the Availability Calendar back-end system: Administrators, Editors and Owners. calendars each having its own looks, options and availability. Our PHP Availability Calendar script supports Wordpress, Joomla, osCommerce. You can integrate the script on any HTML page. 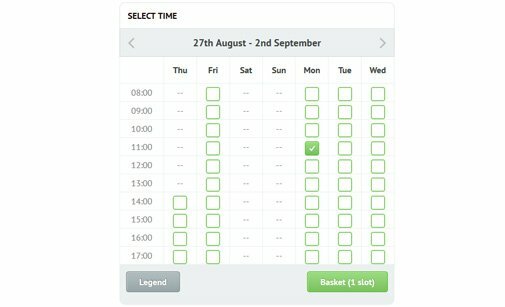 With Availability Calendar you can enable and manage partially booked days and show half-day availability on the front-end. enables you to manage calendars settings and availability. booked). Dates will appear accordingly along with a color legend. PHP calendar script. You can also ask us for a modification. 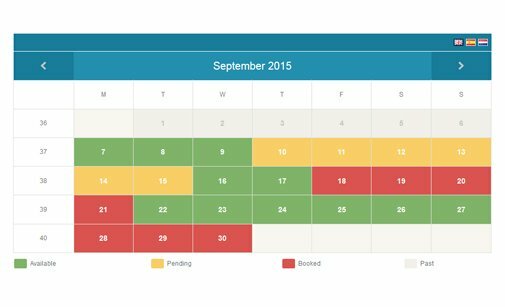 Below is a preview of the Availability Calendar. You can see both the front- and the back-end system and test all features yourself. If you have any questions or need a technical advice, do not hold back to contact us so we can discuss the matter. Preview some of the layouts offered for our online Availability Calendar. Click the button below to open the admin panel of Availability Calendar PHP script. Review other calendar scripts with similar functionalities which can also fit your website and make it more user friendly. You can buy the Availability Calendar script either with a Developer, or with a User License. 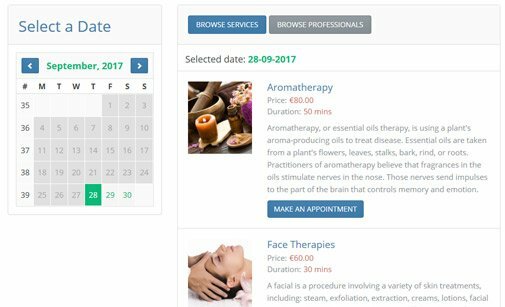 Let our clients share their experience with Availability Calendar and how the script has improved their online business. Thanks so much PHPJabbers... the multiple user calendar script works great. It is by far the best calendar interface I've used. I will use it for all my clients. Hi. Just purchased your multiple user calendar script and have to say it was just what we were looking for being easy to set up. In a word - "brilliant". 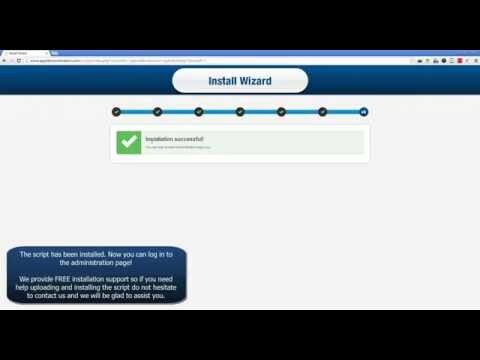 When we purchase something like this and it does what it says it will do, we are always happy to offer you a free link on our website. Just a few lines to say how happy I am with PHP Availability Calendar script. It's very versatile and well thought out. I found that changing the color and size settings so that the availability calendar blended in with the rest of my website was really straightforward and I'm very pleased with the final result. Also I'm pleasantly surprised to discover how easy the automatic updating and resetting of the "booked/available" status is. Perhaps I have some Scottish blood, because I like the idea of a one-off payment, at what I would say is a very reasonable price. At this stage I have only one tourist cottage, but I understand that should I want to expand, I can use the script again. The multi user Availability Calendar is everything it says! It was easy to implement and customer support was on top of the one small issue I had (which was my fault to begin with). The best thing is that it was easy to integrate both the front-end and admin section into the website so everything looked in place. 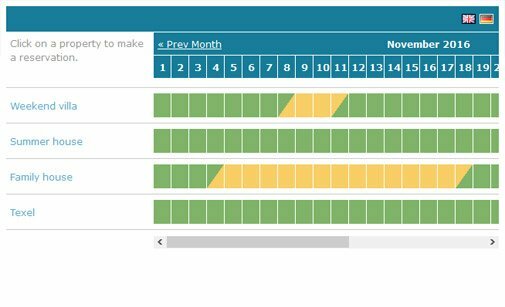 Users find it very easy to update their availability calendars. I would definitely use more scripts from PHP Jabbers. Although I have very little knowledge of PHP and MySQL I found the Availability Calendar script easy to use, simple to install and highly customizable. But most importantly, the online calendar blends with the design and layout of my website. If there is one calendar you need for your website, this is the one! Thank you so much for the great calendar script. I installed a custom multi user availability calendar on a rental property website in less than an hour after purchasing your script from PHPJabbers.com. That includes purchase, download, create a database, custom color scheme to match website, installed, and online. Yes, all that in less than an hour! I'm grateful and very impressed. I really want to thank PHPJabbers for not only the PHP calendar script which has proven fantastic for my needs, but even more for the service and support offered well beyond the sale. 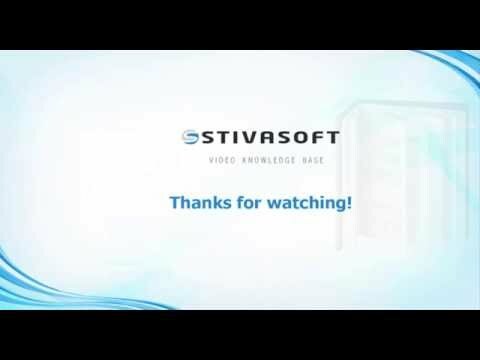 It is easy these days to take a quick PayPal payment allowing you to download software, but what stands out from the crowd is Stivasoft's team waiting to assist you after the sale. They helped me customize the Availability Calendar script to match the needs of my site and responded to e-mails literally within minutes if not seconds. I would encourage anyone fortunate enough to have found PHPJabbers.com to purchase with confidence at this site. They will assist you beyond what you might expect from other download retailers! Well, we have actually bought the availability calendar script with the email marketing script as a gift. I have installed both and they work perfectly. I have to say: very well done! It's easy to install, integrate in the website and to work with!!! The PHP Availability Calendar is brilliant, easily the best I've seen. Many thanks. Thank you! 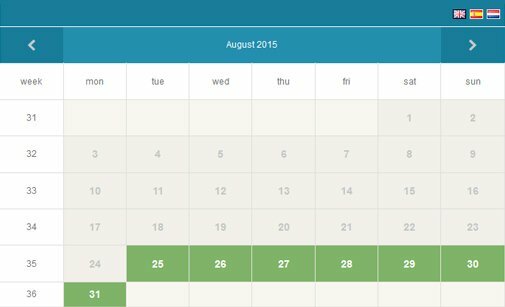 The Availability Calendar PHP script is now active on my website. I am very pleased with how the calendar looks and it's so very easy to update. Again, many thanks for your help and your patience. You have been most kind and understanding. Just want to thank you for the excellent service. Bought the multi user calendar script yesterday and it's already neatly incorporated into our property database. I purchased the PHP Availability Calendar for my client to use on her 4 accommodation websites. The ease of installing them and getting them on the 4 websites was a breeze. My client has found them easy to maintain and can log in quickly to add/delete/edit her bookings. Everything she needs is all clearly labeled and easy to manage. As for the service provided by Veselin Stoilov (founder of StivaSoft and their website PHPjabbers.com) I can highly recommend the great support and ability to assist with advice. I'll certainly use PHP Jabbers' scripts again! I have just purchased your PHP Availability Calendar script and it's absolutely brilliant! Easy to install and with clear instructions, I can't tell you how impressed I am. I will now be looking through all your other products to see if there is anything else I could use! Great multi user calendar script, easy to install and personalize, with professional functionality and look. Very clear and complete even if concise explanations and prompts. Convenient price. I will buy more scripts by PHPJabbers in next future. Read more about our Support Service and how we can help you install Availability Calendar.